In 1972, I met Allen Saperstein in Cobb’s Corner Bar in Detroit. He was bartending. I had just moved downtown to go back to college and finish the BA I had started a few years earlier. That was the beginning of many adventures we had together, including raising two children. In 1973, while I was a student, Allen and I bought a wooden box camera from Art Frasier, an old man who had built the camera and used to peddle photos near the Art Institute. We took it out on the Detroit Cass Corridor streets, then to ethnic festivals, carnivals and fairs in Michigan, and finally traveling down south to Birmingham, Alabama. The story of that journey is at the heart of this memoir. In the 1990s, I wrote a draft of the story and made a pamphlet with the photos. It was entitled, “Falling In Love With Your Memories.” I gave copies of it to a few people; there is at least one copy in my archive at Yale Bieneke Library. I was never completely satisfied with the story, however, and so every few years I would rewrite it again. This past year I learned that our friend who had traveled with us on the carnival route, Halima Gutman, had died; that’s when I decided to go back and finish the story. My son, Michah Saperstein, convinced me to publish it as a website. I thank him for his encouragement and assistance. I also want to thank Mac Gutman, Sally Young, Tony Iantosca and Esther Hyneman for reading drafts and offering suggestions for revision. Special thanks to Isbat Ullah at Long Island University for his help in designing this website. Barbara Henning is the author of four novels and eleven books of poetry, most recently a novel, Just Like That (Spuyten Duyvil 2018) and a book of poetry, A Day Like Today (Negative Capability Press 2015). Poems from her current project, Digigrams, have been published in many magazines, including Journal of Poetics Research, Dispatches Poetry Wars, The Brooklyn Rail, Recluse, Posit andLocal Knowledge.She’s also the editor of a book of interviews, Looking Up Harryette Mullen, and The Collected Prose of Bobbie Louise Hawkins. 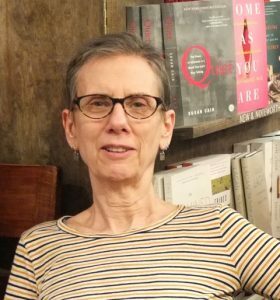 Barbara lives in Brooklyn and presently teaches for writers.com and Long Island University where she is Professor Emerita.